All spins are moving together with the same speed along the same direction. This leads to a phase shift in the signal. All spins are jumping randomly between positions. This results in an attenuation of the signal amplitude. In this post we will have a closer look at this second type of movement. It is closely related to the spreading of for example a blob of ink in a beaker filled with water, which is shown schematically in Figure 1. 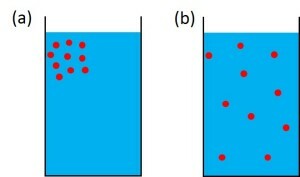 Initially, the blob is located within a small volume (a) near the wall, but over time it will spread out and eventually cover the entire volume (b). The Latin word for “spreading out” is “diffundere”, and therefore this process is known as diffusion. Figure 1: (a) Some particles are dissolved in a beaker of water. Initially, the particles are located in a small volume near the wall. Over time, the particles randomly move around and spread evenly over the entire volume (b). This type of random jumps was first visually observed by the Scottish botanist Robert Brown when he watched pollen grains suspended in water. Nowadays we know that diffusion (another name is Brownian motion) governs biochemical processes, and there is a great interest to measure and understand such random movements. Let us look at the path of a single particle undergoing a random movement. Let’s assume that the movement is not restricted by walls or other particles along the way. Each jump will be of the same length, but their directions will be evenly distributed. Then the path in two dimensions will look similar to the one shown in Figure 2, where each straight line segment symbolises a jump from one time step to the next. 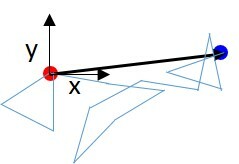 Figure 2: The path of a particle undergoing random movement in two dimensions. The starting and finishing positions are indicated by the red and blue spheres. For reference, we set the coordinates of the starting position as (x,y) = (0,0). The black arrow indicates the net displacement. Here, the angled brackets indicate that the average is taken over the value inside the brackets, and D is a constant characterising the length of the jumps. For molecules within a pure host, this constant is known as the self-diffusion coefficient. This equation confirms what we can visually experience. The blob of ink that we considered at the start will spread faster in a low viscosity fluid like water than in something very viscous like glycerol. It will also spread faster at a higher temperature. And finally, smaller particles will experience less drag and move more freely in a liquid than larger particles. The whole point of equation 2 is that if we can measure the diffusion coefficient of a molecule in a host liquid, we can probe the size of this molecule. The next posts will show how this can be done, along with some exciting results using a Spinsolve benchtop NMR spectrometer. Please keep tuned for the next post in this series where we will introduce an experiment to measure diffusion on a Spinsolve benchtop NMR spectrometer.